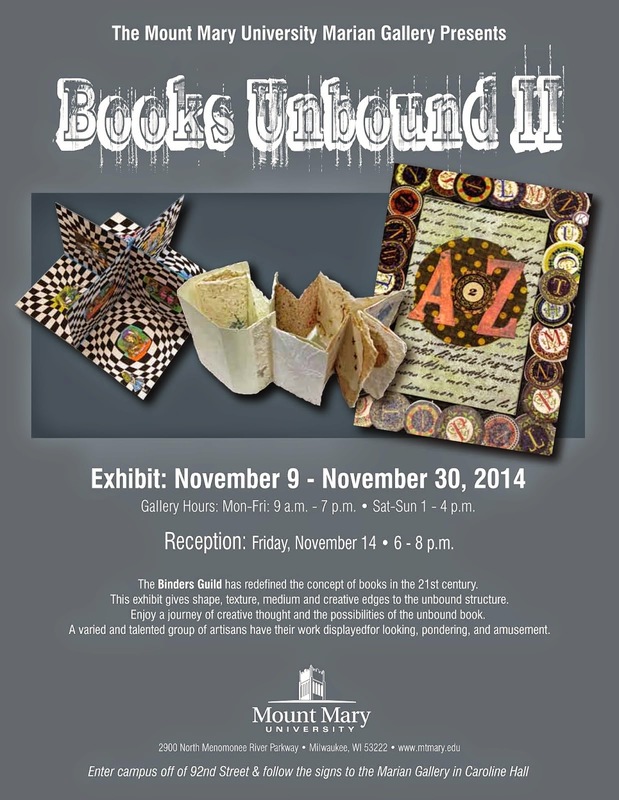 I just dropped off my pieces today for the show "Books Unbound II" by members of the Binders Guild book arts group here in Milwaukee. The show will be up November 9-30, 2014 at the Marian Gallery in Caroline Hall at Mount Mary University, Milwaukee, Wisconsin. 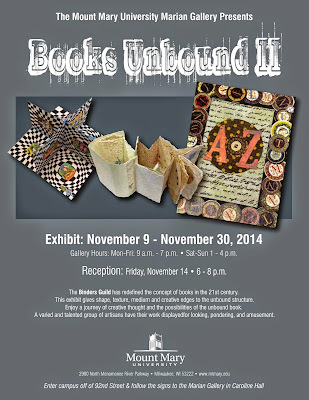 There will be an opening reception on Friday, November 14, 2014 from 6-8 p.m. (See also my previous blog post.) 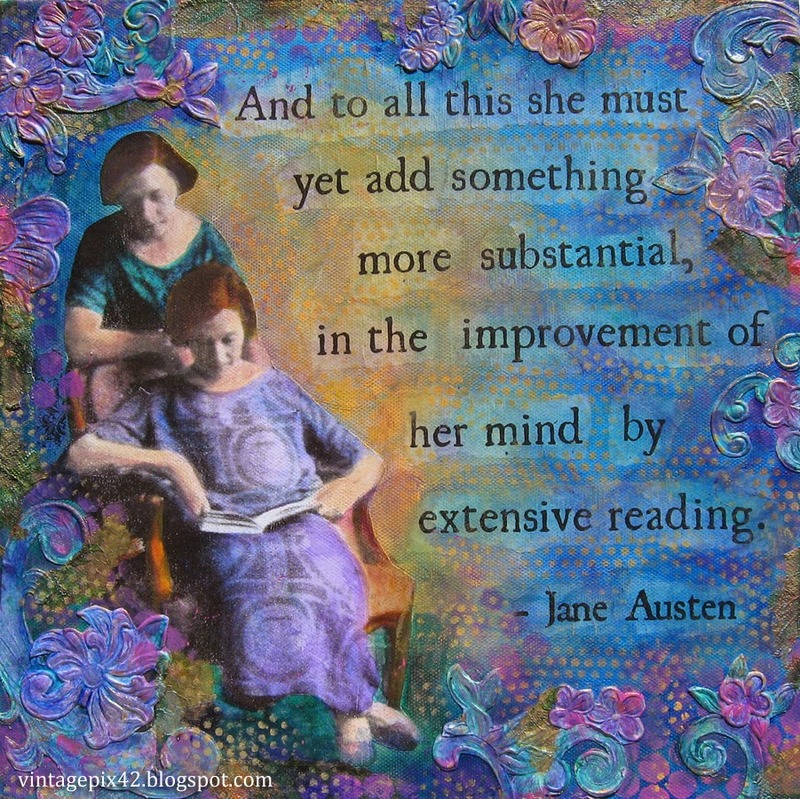 There will be quite a variety of handmade books and other book-related art. We each had to do a 12x12" canvas around the theme of story-telling so I used a quote from Jane Austen's Pride and Prejudice for my collage. We also each did an abecedarium or alphabet book. 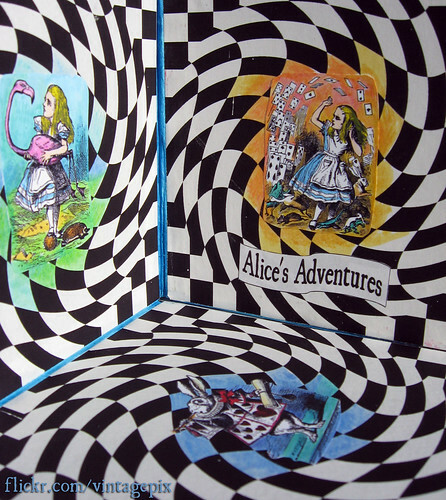 Mine is an accordion book "A to Z Tangles" with 2" square pages, each featuring a different handdrawn tangle pattern. 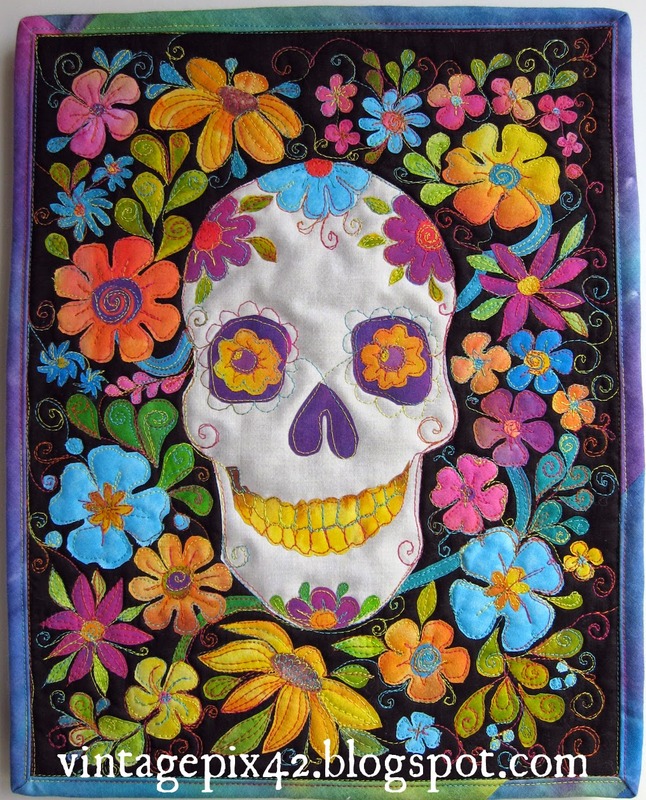 The back of each page has the designer's name listed for each pattern. I had a lot of fun drawing these, but some letters it was difficult to choose just one pattern! 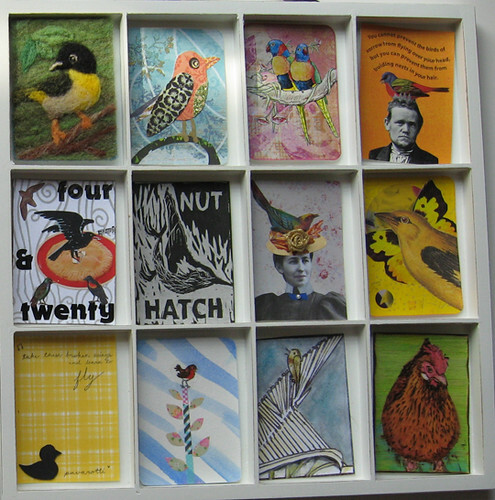 We also each did a piece inspired by the theme "Cabinet of Curiosities." 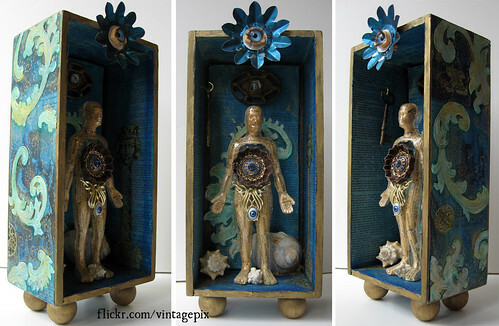 For mine I added to an assemblage piece "Inexplicable Syncopation" that I had done in 2007 for a show at the Bay View Book Arts Gallery, because I had never felt that the piece was quite completed (and I still don't but I had a deadline). You can see these and my other books on Flickr here. 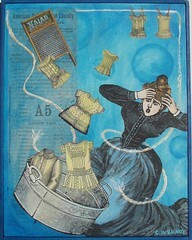 I'm submitting work for two shows this fall and also participating in the Crafters Marketplace again. 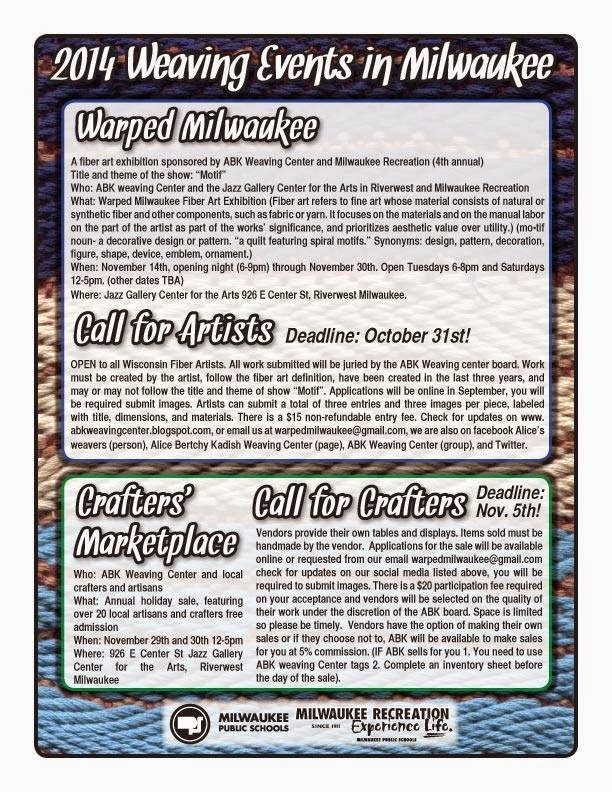 You can also find the info and the links for the separate applications for both the fiber art exhibit and Crafters Marketplace on the ABK Weaving Center blog and the Warped Milwaukee Facebook page or Google+ page. 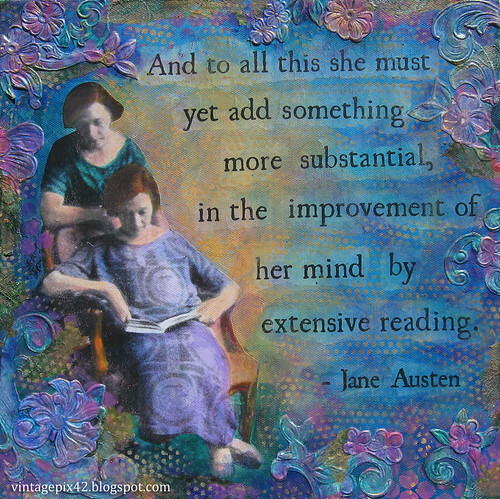 So even though I have not been blogging, I have been busy! It's been a few months since I've blogged, but I'll try to get back in the swing now that spring is here! 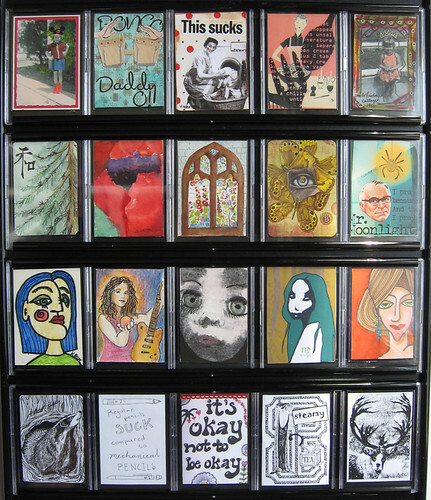 I've got a show up this month at the Creative Arts Resource & Network of Western Racine County (CAR&N) gallery, 220 E Main Street, Waterford, Wisconsin, featuring Artist Trading Cards (ATCs) made by members of the Milwaukee ATC group (including myself). 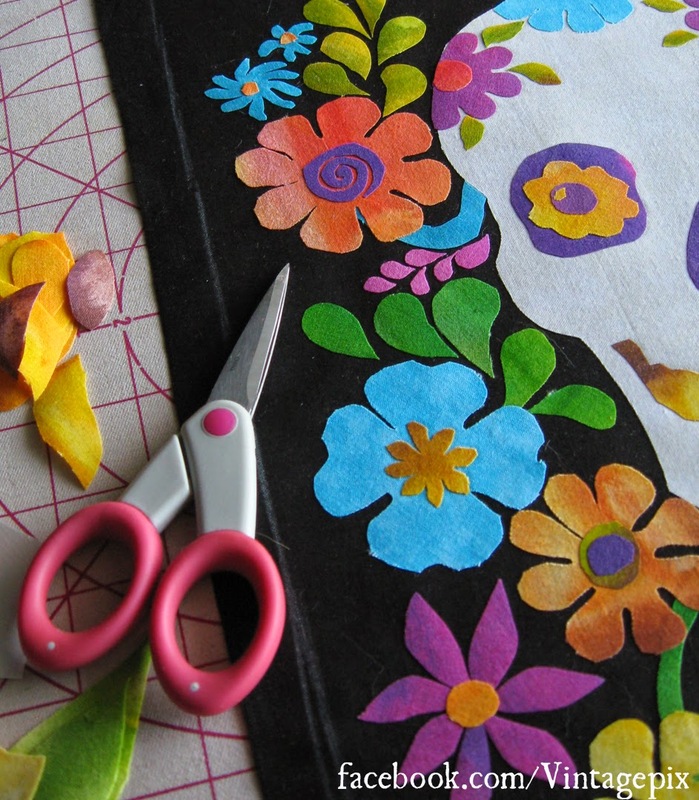 There's quite a variety of art from traditional painting and drawing to collage and assemblage using everything from fabric & fibers to recycled objects and wire and glass. 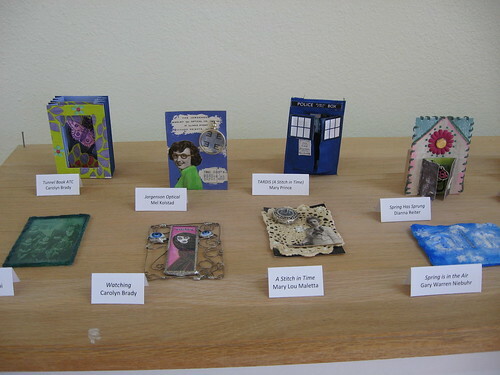 The display case in the first photo above includes some fragile and three-dimensional ATCs. 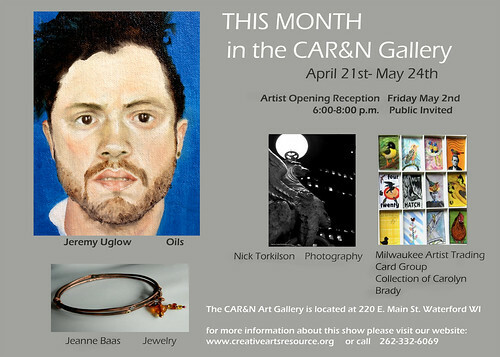 If you are in SE Wisconsin or Northern Illinois and interested in seeing the show in person, this Google map shows the location of the gallery as well as some local laces to eat nearby. The actual gallery hours vary (and are not what is listed on their website). They are generally open Tuesday-Friday 10-4 and Saturday 10-3, and are sometimes open Wednesday & Thursday evenings until 8 pm but they may close early some days if they do not have any visitors. If you are driving from a distance, I would recommend calling ahead to make sure that they will be open when you are planning to go. If you are unable to see the show in person, you can get a photographic overview on Flickr here. Besides the Milwaukee ATC group's display, you can also see paintings by Jeremy Uglow, photographs and collages by Nick Torkilson, and jewelry by Jeanne Baas. The ATC portion of the show will be up until about May 23, 2014.